There is no charge to get a library card, if you are a resident of Ohio. In order to get a library card, a current state of Ohio issued picture ID such as a driver’s license, with the patron’s current address on it, is preferred. If a patron does not have a current state of Ohio issued picture ID, two current forms of proof of identity are required. This can be a school or work ID, bank statement, utility bill, lease or other identification judged acceptable by the Head of Circulation, Manager, Assistant Manager or person in charge. Proof of current address must be presented. If a utility bill, bank statement, or something similar is used as proof of identity, it must be no older than 4 months. A signature of a parent or guardian is required for children under 18. The parent or guardian is responsible for the appropriateness of materials used by the child, including electronic information, and for payment of charges incurred with the card. The parent/guardian will receive a letter advising him/her of these responsibilities when the application for a child’s library card is made. Out of state and/or temporary residents must have a local address in the Willoughby-Eastlake or surrounding communities in order to obtain a library card. They must also present a form of identification showing their current permanent address. Local residents who use a post office box number must present two (2) forms of identification: one showing their post office box number and another showing their current home address. In order to maintain current information on cardholders, library cards expire after two (2) years and information in the patron database needs to be updated at this time. Cleveland Public Library purges the patron database of borrower records that have not had activity in three (3) years. This is done on an annual basis. A library card is required to check out materials. Customers without a card in hand can either complete the library lookup form or present a driver’s license to the circulation staff. Cardholders are responsible for all materials borrowed on their card. They should report lost or stolen cards immediately. Library card replacement fee is $1.00. Cardholders should inform the Library of changes in address, e-mail address or phone number as soon as possible. The Willoughby-Eastlake Public Library also provides eCards for Ohio residents over the age of 18 that allows access to all emedia resources and databases only. Users must provide a valid name, address, email, and phone number and must not have a current CLEVNET card. For information about our eCards click here. A total of no more thatn 50 items can be checked out at a time. Materials may be manually renewed in the library, by telephone or via the library catalog. Fast Favorites, devices, toys, and video games cannot be renewed. If the fines or fees on your card exceed $10.00, your account will be blocked until the overdue items are returned or your account balance is reduced to less than $10.00. If you have 5 or more items overdue, your account will be blocked until the items are returned. If an item is not returned within 21 days of the due date, you will be charged the replacement cost of the item. Be aware that fine free only applies to W-E Library items. Items borrowed from other libraries will be subject to the fine policy of the owning library. Each library has outdoor book and audiovisual drops that are open 24 hours per day. 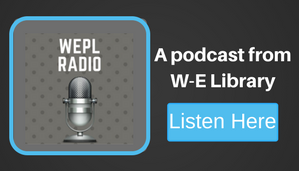 Material not available through the WEPL or CLEVNET system may be requested through our Interlibrary Loan Service. The library card used to request materials must be presented when materials are picked up. Only 1 Launchpad, tablet, and/or hotspot may be checked out to a cardholder. Tablets, Launchpads, and hotspots may not be circulated through interlibrary loan. These items must be returned to the library where the device was checked out. They cannot be returned to other Clevnet libraries. Electronic devices should be returned directly to the Circulation Desk. Dropping the device in the book drop will result in a fine. Some items may require an additional Borrower Agreement to be signed & completed at the time of checkout of the item.